(Nanowerk News) Automation is becoming increasingly important in the field of biotechnology, and the only mean of simultaneously testing thousands of substances on cells, or of creating artificial skin models at competitive prices. The location of Stuttgart Vaihingen, home to the Biopolis testing laboratory, which was officially opened on 9 February at the Fraunhofer Institute for Manufacturing Engineering and Automation (IPA), is playing a part in these developments. At the laboratory, engineers working alongside life scientists are creating complex devices to fulfil the specific requirements of biotechnological research. "The technology doesn’t exist, or isn’t efficient enough," said Jan Stallkamp from the Fraunhofer Institute for Manufacturing Engineering and Automation to the newspaper Stuttgarter Zeitung at the Biopolis opening. The Biopolis lab is based at Stallkamp’s department in the IPA in Stuttgart-Vaihingen. Interdisciplinary cooperation is vital for the work of Biopolis, where biologists are benefiting from the experience of engineers. 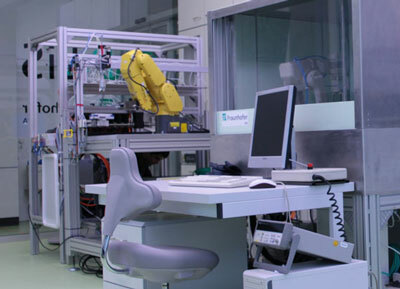 The technicians at the lab know how small objects can be machine processed, or how robots can best handle tiny amounts of fluid, as is required in the chemical and pharmaceutical industries. The engineers also have a thing or two to learn from the life sciences. As an engineer, bacteria and cells from the body rarely behave exactly as you would like them to, complains Stallkamp. "In addition, there are a thousand factors that are different to what we're used to, from air conditioning to hygiene." For example, the gearboxes in the robots must be encapsulated to prevent wear debris from contaminating the cell cultures. Furthermore, permanent sterilisation poses a challenge when designing the seals for the machines. Robots will take on a range of tedious tasks in the biotechnology laboratory of the future, such as in the multiplication of cell cultures. The first major project at the laboratory, which cost approximately 700,000 euros, is a Fraunhofer development: a tissue factory that fully automatically constructs three-dimensional dermal tissue constructs. In terms of structure, skin is relatively clearly constructed, consisting of a number of cell layers that are stacked like bricks. The top two layers, the epidermis and the dermis, are not supplied with blood vessels. Further inside is the subcutis, a well vascularised connective tissue with accumulated fat, hair follicles, and sweat glands. Thanks to the relatively simply layered structure of the skin, the cultivation of issue in the laboratory has in recent years developed into the extremely successful application area of “tissue engineering”. Indeed, skin was the first living tissue to be reconstructed from human cells. This was first achieved in the 1980s, and was created for aesthetic corrections for use in plastic surgery. Today, laboratory-reconstructed and cultured skin are two significant fields of application: In medicine, it is often the last resort for patients with severe burns and chronic wounds. The cosmetics and pharmaceutical industries use skin grown in the culture dish for testing new substances. EU chemicals regulations, which came into force in a revised version last year, state that thousands of old and new substances should undergo examination with respect to contact with skin. "There is thus a huge market for skin tissue,” said Andreas Traube at the Biopolis opening, which was also attended by Ekkehard Warmuth, Director of the Office of Biotechnology at the Federal Ministry of Education and Research. Traube, a trained mechanical engineer, is responsible for the area of bioproduction engineering at the IPA. Other research groups have also discovered the potential of test tube-cultivated skin. With the support of the BMBF, scientists at the Technical University of Berlin have developed a skin model that is created using not only skin cells, but also hair cells. The prototype tissue factory being developed at Biopolis is lined with skin cells. If all goes to plan, three-dimensional and fully functional skin samples will be created fully automatically from just a small skin sample. When finished, the engineers are aiming at a capacity of 5000 skin constructs per month, at a price of around 34 euros each. These artificially produced skin samples could be used in the pharmaceutical industry, for example. The joint project of the four Fraunhofer Institutes will begin operation in just one year’s time. The project is headed by Heike Walles from the Institute for Interfacial Engineering and Biotechnology (IGB) in the neighbourhood of Stuttgart; also involved are researchers from the IPA, the Institute for Production Technology in Aachen, and the Institute for Cell Therapy and Immunology in Leipzig. The other organs in the body are more demanding than skin. At the IGB, Johanna Elizabeth Schanz and Heike Walles have developed a system that is akin to an artificial liver, which is also set to serve as a test system. "The unique thing about our liver model is the workable system of blood vessels," says Schanz. "This will create a natural environment for the cells." In a specially developed, computer-controlled bioreactor, the cells appear to function similarly as in the body. Their roles include detoxification, breaking down medicines, and building proteins. All of these are important requirements for drug testing or transplantation. This is because the conversion or breaking-down process can alter the effects of a substance - some drugs are first converted into their therapeutically active form in the liver, while other drugs form toxic substances. In the meantime, researchers have been able to demonstrate the ultimate potential of tissue models, be it liver, skin, intestine or trachea. At this time, the test system is in a trial phase. In two years, it may well represent a safe alternative to animal testing. Biopolis is not limited to the development of devices for tissue production. A device that is intended to replace pipetting is also in the final phase of development. Tiny holes at the bottom of tubules produce small liquid droplets that are pushed off with a well-aimed puff of air, before being caught on an underlying mounting. These drops can be as small as a few nanolitres. This technology, which enables thousands of chemicals to be simultaneously and automatically tested, is likely to find application in the pharmaceutical industry, among others. Interesting for stem cell biology is a device that independently monitors cell cultures with mouse stem cells and automatically sorts out those in which DNA has been successfully inserted. Another prototype undergoing further development at the Biopolis laboratory takes over the complete cell culture passage process. This refers to the hard work required when distributing growing cell cultures in new containers with nutrient solution. Alongside its support for the in-house developments at Biopolis, the Fraunhofer Institute also wants to open up the new market of biotechnology laboratories to device manufacturers in the region. On top of this, Biopolis also provides customised equipment for research institutes, the first shipments of which have already been delivered.